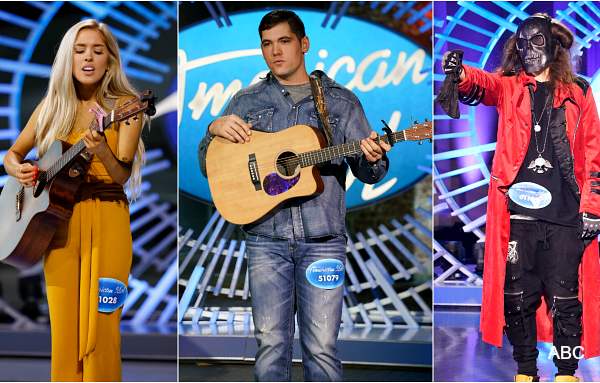 Reality singing compeition show “American Idol” returns for its second season on ABC this Sunday. The network had the fortune of putting together celebrity judges who have such great chemistry that all three returned – Lionel Richie, Katy Perry, and Luke Bryan take their same judges’ seats. Basically the ABC/Disney network seems to have made “American Idol” it’s flagship family show with, like in season one, by heavily concentrating on the family dynamics of the (mostly) young singers auditioning. 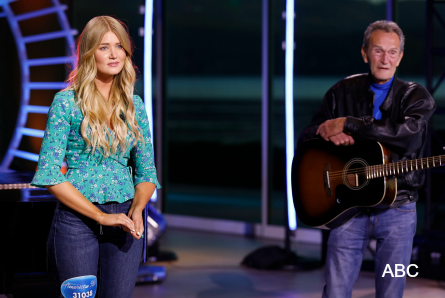 The new “American Idol” pays way less attention to the show’s signature unsuccessful auditions when it was on the FOX Network which were always followed by harsh criticism, notably from original judge Simon Cowell. 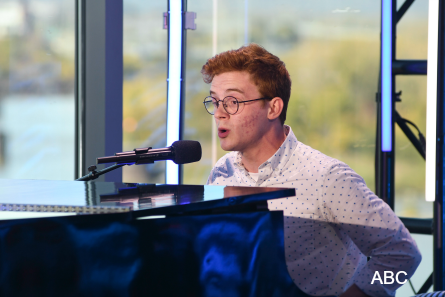 Instead, what viewers see are a ton of uplifting auditions from talented young singers who come with incredible backstories and overcoming unbelievable obstacles. By the end of the “American Idol” season two premiere, audiences won’t be left with a dry eye. Some of the circumstances that these auditioners have faced include homelessness, and family deaths. The show opens with the typical shots of small town America with judge Luke Bryan voiceover stating how singers from all across the country are looking for the opportunity to “write their own future….American Idol is that opportunity.” Some of these young adults who auditioned for “American Idol” are doing it to be role models for their even younger siblings. The show also exposes some of the judges own relatable backstories that they share with the contestants. Katy Perry talks about how she met her boyfriend, Luke Bryan shares a personal story about his family with a singer going through the same thing. 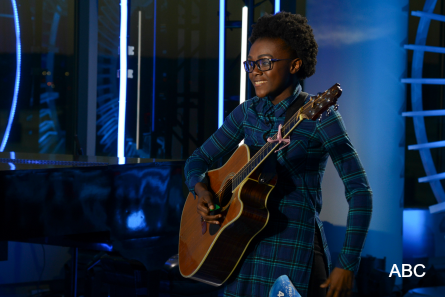 “American Idol” achieves pulling viewers’ heart-strings with in-depth personal stories. This gives a stronger sense of bonding between viewers and contestants. 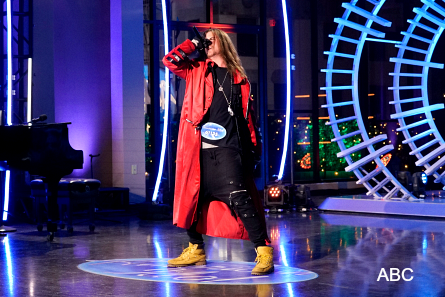 The show defines the scenario of a small time boy or girl becoming the next American Idol. Katy Perry said “these stars in the making have to trust in themselves. It’s very difficult thing to put yourself out there.” Indeed so, which is exactly what viewers will see with one young girl Khalifa, or “Kai the singer” who was so nervous during her audition, she got to sing another song. “American Idol” started the season off right with an inspirational visual of these young hopefuls lighting-up their dreams via lanterns then sending them up into the air in flight. Judge Luke Bryan stated that “American Idol” tells the stories of these kids’ struggles to get there. “When I hear an amazing audition, it makes me believe in music all over again,” said Bryan. More on the singers featured in the “American Idol” season two premiere episode are recaped below. We can’t reveal who’ll get the Golden Tickets to Hollywood. Tune in to find out. SPOILER ALERT Past this Point!! 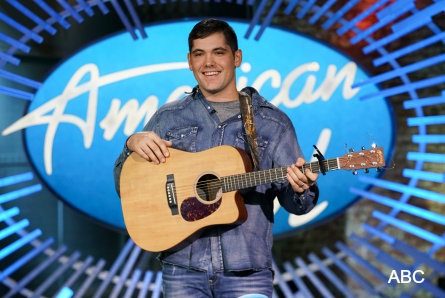 Walker is a 20-year-old student who attended the “American Idol” auditions with his parents. His mom loves Lionel Richie, which makes Walker also love Lionel from growing-up with it. He sang “Love Like This” by Ben Rector while playing the piano very elegantly in an Elton John sort of way. After his audition, Katy complimented Walker, “that’s just so natural, and cool and effortless and dope.” She said he favored Ben Folds, Billy Joel, Randy Newman. Katy called Walker “Top 10 material.” Luke Bryan said people at home will be captivated by him, then asked him to sing a Lionel Richie song. Walker hopped back onto the piano to sing and play “Hello.” Lionel told him he was very proud of him and excited for Walker. It was the first time “American Idol” ventured to the city of Idaho to offer-up locals auditions. Johanna Jones is 23-years-old from Las Vegas, NV. She works at In-N-Out burgers and Katy went crazy. She told the story of how she met her boyfriend “over” In-N-Out at the Golden Globes. Katy explained that she had her security guard grab In-N-Out burgers. Suddenly, her boyfriend (who wasn’t her boyfriend at the time) swooped-in and grabbed it. Johanna and Katy proceeded to also share their love of potato chips and devoured small bags of them at the same time. A 19-year-old Khalifa said her childhood consisted of living in and out of shelters with her family. Currently, she lives with eight people in the house. She’s hoping for her music career to pave the way to a better life. Lionel said the smile on her face “cancels everything else out.” After she wiped-away her tears, Kai sang Ed Sheeran’s “Thinking out Loud.” Part-way in, Luke Bryan asked her to stop. Then the judges tried to calm her nerves. Kai then played on the piano and sang much more relaxed. Katy told her she has a “beautiful soul” and evolved in front of them after she got on the piano. Luke said “it stirred so many emotions” in him. Kai revealed that her church financed her trip there. After that, Katy lost it and teared-up. This hit home because Katy told her about her struggle of growing-up in the church with no money, and the church bought her a guitar. Last season, Katy said they found some of their “biggest” singers in New York City. Tyler is in the oil field, and it’s his first time doing anything like auditioning for “American Idol.” It’s also his first time in New York City. His parents support his dream by telling him to use his “God given talent.” He sang “Whenever You Come Around” by Vince Gil. Katy was immediatley taken by Mitchell’s 6’4″ frame and undeniable masculinity. Katy reacted “literally, a star is born.” Lionel told him that he “struck oil,” and woke them up. Luke advised him to smile through the awkward time, and America will love him. Bobby Bones is American Idol’s season mentor and will be helping-out singers who make it through each phase. Ethan called himself a mystic death creature vocalist. Ethan said he’s created a new genre of music called “mystic death trek metal.” Ethan came bearing gifts – well only for Katy. He presented the gift to her inside a black pouch. Ethan sang original song “American Creature,” while Lionel and Katy were so spooked by him they hid under their judges’ table. It sounded like a mix of rap and death metal. After it was over, Katy reacted while peeking her head over the table, “that’s really different.” Luke called it “very unique” and could get a “badass mosh-pit going.” Lionel, also staying under the table, told Vokillz it won’t work-out for him when it’s time for duets and this is not his lane. Margie is 25-years-old and possibly the most enthusiastic contestant there has been ever on any reality show/game show in history. One unfortunate quality about Margie, who comes from a family of doctors, is that her nerves makes her burp a lot. After Margie’s audition, Katy reacted “you’re literally a star.” Then Margie had a melt-down with happiness. Katy advised her to focus on winning with her voice, then switch back to her natural personality. In true “American Idol” tradition, there was a lull in auditions with many hopefuls having a dream without any actual singing talent. Lionel told one singer to “find notes you can hit.” Then Luke said “you’re biggest hurdle is just your voice.” They broke it to one singer very gently, “that is extremely artistic…and artistic.” And “you’re all about the full delivery.” There was also a Michael Buble style singer who made his best efforts to persude the judges by taking his shirt off. Well, it did work on one of the judges, you can guess which one. Uche is 25-years old, and grew-up in the church. He said there’s a positive message in his music and trying to reach kids. He sang “Ain’t No Other Man” by Christina Agurelia. His audition consisted of my dance cheorgraphy than singing. Then Katy challenged Uche to stand still and sang. It worked-out better and Uche belted-out a gospel tune. Katy told him she thought he’d be “really spicy” to have in Hollwood. Luke questioned how much coaching Uche would need in the competition. Before Uche left his audition, Lionel made him a bet. Laci is 23-years-old from Livingston, Texas who’s been singing since she was three years old. She was raised by very young parents who had her at ages 15 and 17 years old. Her parents divorced whe Laci was three years old. She was raised by her mother while her dad was chasing his dreams as a singer, playing shows. Her dad took her to Arkansas to record and that’s when they bonded again. Laci said music made-up for the lost time with her dad. Laci sang “Mama Tried” by Merle Haggard. Her sound was Country and sweet while she sang and played the guitar. Katy called her the first voice they’ve heard that’s a “diamond in the rough.” Luke told Laci she “slayed it,” and belives she’s very close to being a world-class.” – then Katy and Lionel cut him off. Lionel advised her to concentrate on her own thing and not get psyched-out on everyone else’s thing, she’ll do well. Nick, who is 17-years-old tried to win-over the judges by first dedicating his audition to Katy. He threw-in a smooth rap at the end. He said his influences are Kendrick Lamar, Kayne West..(pause) Lionel Richie. Then couldn’t name a Lionel Richie song when prompted. Lionel acted devastated. On the extreme flipside, superfan Tiffanee Le May walked in who idolizes Lionel Richie and said “Lady” is her favorite song. She showed-off one of his albums she owns that opened-up to a full poster of Lionel. Lionel suddenly got his swager back and signed her album for her as a token of good luck on her “American Idol” audition. Tiffanne sang “The Best Part” by H.E.R. and Daniel Caesar. Lionel reacted that he liked her style and he knew there was something about her when she walked-in. He state that her voice is her style. Katy gave Lionel the side-eye and said Tifannee is “teacher’s pet.” Luke advised Tiffanne to open her mouth a little more and enounciate. Nick is 26-years-old from Nebraska and currently lives in Los Angeles. He told the judges that he’s there for his brothers. He lost his older brother Zachary, who was in the Air Force, to suicide. Nick was in Japan teaching kids and performing when he lost his other brother, who also took his own life. Nick was left dealing with guilt for not being there for his brother. Nick said he knows that his brothers would want him to keep pursuing his dreams, “to keep going.” After Nick’s audition, Lionel said there’s a wonderful quality in a voice that you can’t study which is called a “natural cry.” He said they call that “money.” Katy said Nick’s voice had “power” and beauty. Luke said there’s a simplicity to how Nick sells his voice that’s understated. Luke revealed something that he’s never talked about on the show which is that he too lost both of his siblings and applauded Nick for keeping a positive attitude. “American Idol” season 2 premieres Sunday, March 3rd 8-10 pm EST on ABC Network.